Whether it's a laptop or desktop, for most people, our computer is our life. It's our link to the world; friends, family and our beloved entertainment, and an essential part of life for the average college student. 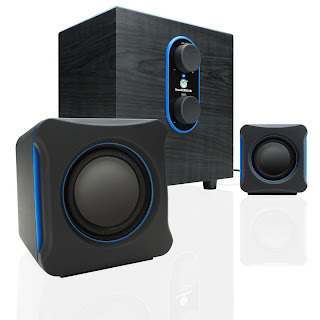 The one thing that makes the difference between a good computer setup and a great one is a killer sound system! This is where the GOgroove SonaVERSE LBr comes into play. Not only will the duel ported, dynamic-range speakers deliver powerful sound but it will also immerse you into the depths of music and game play. Unlike many popular USB powered speakers that are plagued by hollow audio and lackluster quality, the SonaVERSE LBr offers impressive clarity and fullness. Dual 3-watt satellite stereo drivers deliver rich mid-range & high frequencies, while the 5-watt subwoofer powers deep, resonating bass. Integrated volume & bass level equalizer knobs allow you to find the perfect audio mix! With a 22 watt maximum payload, the LBr will make your friends green with envy. With the option to power via USB port or the included AC adapter, you can take the LBr virtually anywhere. Simply plug the USB power cable into your laptop or computer, insert the 3.5mm cable into your audio jack, and start rocking out to your favorite tunes! The design is perfect for a portable setup in the office, classroom, bedroom, living room, or home entertainment center. SonaVERSE LBr is the perfect back to school gift for any college student - it's ideal for a dorm room, and will blow their friends' laptop speakers out of the water! The GOgroove SonaVERSE LBr is on sale now for just $24.99 with the newsletter code.